I know you have all been waiting on pins and needles to see my finished chair...well wait no longer! If you want to see from start to finish, here is back where I started. Removing the yucky fabric and million staples that held said fabric on, leaving me with a wood frame and some burlap. Also having a little design ADD when picking out fabric- as discussed here. 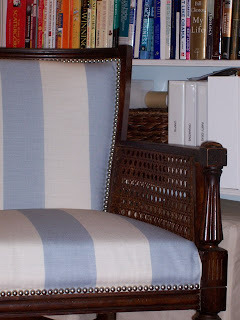 A lovely blue and white striped fabric chair with brushed nickel nail head trim detail. Finished it just in time for the BF to come home on Sunday- fingers crossed he likes it. Lastly, I need to give three lovely bloggers a large THANK YOU. Camila from High-Heeled Foot in the Door and Lauren from Pure Style Home for helping me with my struggle in fabric choice by emailing me lots and lots of ideas. Also, Kristine from Living With Style for the amazing shout-out she gave me on her blog today. Thank you, thank you, thank you to all three of you!! OMG. this chair is bananas. i wish u lived locally, i would pay you to do that to mine. you did a really nice job on this chair.. love the detail you put into it. it looks so good! great job! Sweetie it came out great. I love the stripes! You must make a trip to NY and help with my many, many, many projects! love it, so beautiful. Great fabric choice. LOVE it! 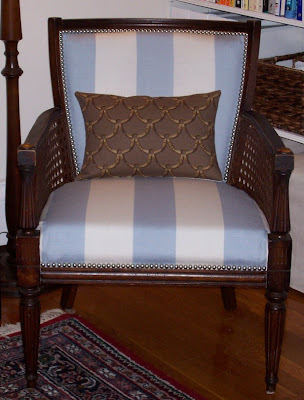 That fabric is fabulous and perfect for the chair. I bet it feels so good to have it done and to have created something oh so pretty! OMG. It is stunning. I love that fabric. Great work! wow that chair is so pretty. 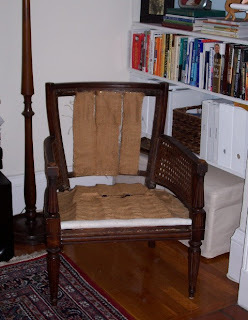 Can you do a post on how you did your re-do on the chair! Love it! Wow, I can't believe that's the same chair! You are so talented and I'm sure the BF is going to love it. Enjoy your weekend - spend lots of time in your beautiful new chair! * Your PERSONAL CREATION here is SIMPLY FABTASTIC! Kudos, kiddo!!! You did a wonderful job - pat on the back and big grins to you! Been following for awhile and now I just have to jump in to say...WOW! I must have five chairs lying around that need to be recovered, rewoven, resomething..thanks for the inspiration. 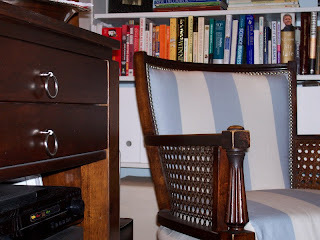 LOVE the light blue and white stripe with the dark wood, very elegant! The chair looks fabulous! The fabric is absolutely the perfect choice. Nicely done! Awww thank you everyone for such sweet comments- you are all too kind!! Gorgeous. I can't believe you did that. Incredible! WOW! Came over from Camilla's & your chair is just outstanding. I love, love it! You should be very proud of that one. Lindsay- it looks so great! So glad you didn't paint it white- it looks great like it is! woot-woot! looks sooooo good! amazing job! Ah! I can't believe I am just now seeing this, it looks AWESOME! I can't believe you did that by yourself, you are so talented! I can't believe you did this yourself- bravo! 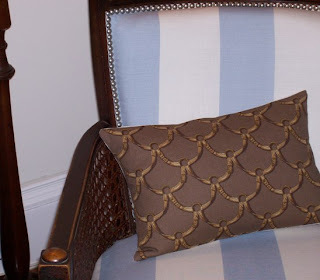 The fabric and nailheads look great. I almost can't believe its the same chair! Looks fabulous! The nailheads are great. I just almost finished reupholstering a couple of finds, so I know what a big messy job it could be. Nice work! LoVe IT!!!! Linds, it's the peerrrrfect fabric. She's a beaut! 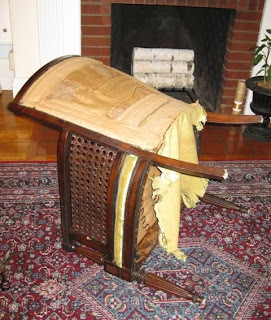 Your chair turned out great! I love the pastel stripes accented w the silver studs! 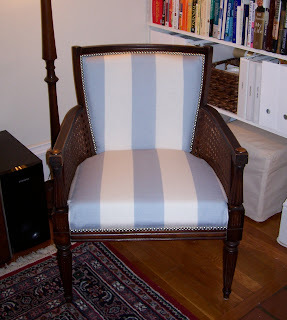 Your chair looks fantastic and I love the fabric you used!!! Your chair is so lovely!!! I've been waiting to see the end results and I'm not disappointed. Way to go!!! STunning transformation!! I'm just speechless b/c my jaw has hit the floor! Oh my gosh, you simply must must must do a step by step post on how to do this! 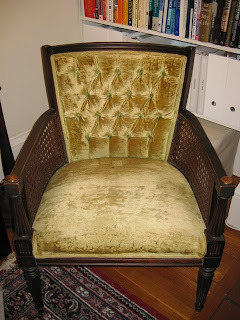 We have a chair that I was dreading taking to the upholstery place because I knew it would cost a kabillion dollars. It looks beautiful and I'm linking up to stay tuned! the chair redo looks soo great!!! all of your hard work is soooo rewarded - congrats!! Okay I promise this is the last comment I'll post today... but I just thought it was hysterical that I picked nearly the EXACT same fabric for my chairs-- looks fabulous! Great job!